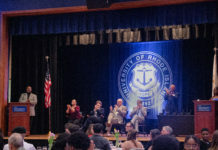 Last semester after a series of violations, misconduct, and an extreme instance of drunk driving, the University of Rhode Island chose to suspend the Rho Iota Kappa chapter of Chi Phi. While their fate hung in the balance for quite some time as the university and the fraternity deliberated, the ultimate decision was to remove the chapter from campus and to give the remaining brothers that lived in the house until the end of the semester to find new living arrangements. With Chi Phi vacating the house, it soon became apparent that the fraternities and sororities without on campus houses would be interested in acquiring 11 Fraternity Circle..
People took to the anonymous social media site, Yik Yak, posting things like “Kappa Sig should take Chi Phi”, “Give it to KD”, and Â “CHI PHI FOREVER”. As of this semester, the Theta Theta chapter of Kappa Delta has acquired a five-year lease for the house and some of the sisters have already moved in. “Over break we had received emails about KD trying to get the house and nationals approving us,” explains a freshman that joined Kappa Delta in October of last semester, after Fall Rush. Until now, Kappa Delta was the only social sorority at URI to not have their own on campus house, and instead rented out several rooms in the back of Phi Gamma Delta (FIJI). “There are currently 20 girls living in the new house and they are all new KD members,” said one of the sisters of Kappa Delta who wished to remain anonymous. One sister added “The rest of Frat Circle is still kinda getting used to the idea that we’re a sorority, because we are pretty new, but they don’t act differently towards us because of it,” and that they definitely feel welcomed to the community. One thing that has yet to change are the letters on the outside of the house, “the front letters came off over break so I’m surprised they haven’t gotten the ones on the side as well as the PIK charter letters,” said a Chi Phi brother, “there are also letters in the house that cannot come out without construction so I’d imagine those will stay,” he explained. No sister of Kappa Delta was available to comment on when or if they will be switching out the letters at least on the outside of the house.